Water is one of the most important things on this earth. It’s essential to life and takes up 71% of the earths surface. So if you pour a glass of water, how old is that water? It could have only been a week since it rained down, but how old actually is it? The current theory is that billions and billions of years ago, during the time of the big bang, when the earth was still forming. Asteroids holding ice crashed into the earth for many years and left water throughout the Earth. So the water in our glass is actually billions of years old, but how is it recycled? This recycling of water is refered to as the water cycle. Its made possible because water can convert into a solid, liquid and gas with out sever temperature changes. Observe the animation to the right. Notice the speed at which the water molecules are moving and how much space they are using. Click on the buttons to find out What happens when we cool the water and what happens when we heat the water. You’ll notice that when you drop ice is water it floats, but why does it float if its all made of the same thing? The reason it floats is because of its density. If you look at the animation to the left. Frozen water the molecules slow down and become ordered, but they leave big spaces between them. 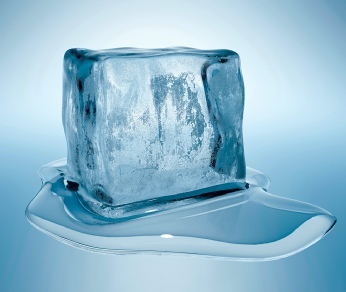 This means that ice is less dense than water, making it float. Click here to learn about buoyancy. This is the same reason why you should never put a glass of water in the freezer. The ice will expand and crack the glass. 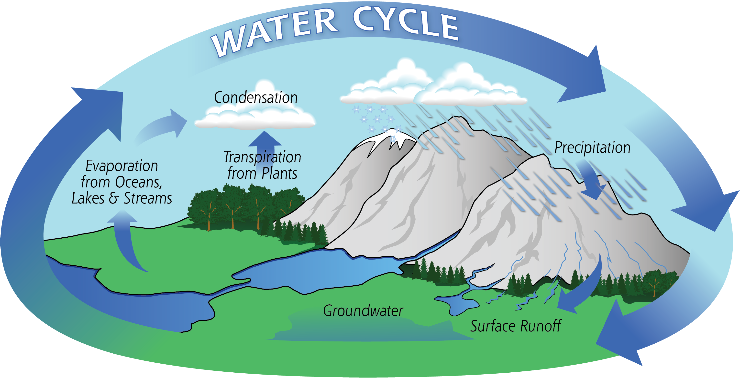 The water cycle is how all the water in the world is recycled. Throughout the cycle, water goes through all states of matter, Liquid, gas and even solid. Despite 71% of the earth being covered in water, a surprisingly small amount is actually drinkable by us. 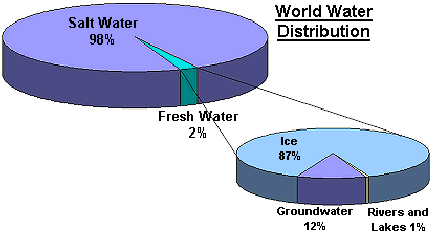 Of all the water on the Earth only 2% is fresh water, and of that 2% only 1% is found in rivers and lakes. At this stage water changes from liquid to gas. The sun heats the water in the rivers, lakes and oceans. The water vapour rise through the air into the atmosphere. When the vapours rise, they leave behind all the salt, minerals and metals. At this stage the gas turns back into a liquid. As water vapour rises, it becomes cooler, turning back into tiny liquid droplets. These droplets merge together to form clouds. Precipitation is when rain, snow or hail falls from the sky. This happens when so much water has condensed that the air cannot support its weight. Depending on the air temperature, water can take liquid (rain) or solid (hail or snow) form. Once the water has fallen down, some of it lands on land and is soaked back into the ground. The water is collected underground and called groundwater. Some of it is absorbed by plants while the rest seeps into the rivers and provides a steady flow of water after the rain has stopped. If the water isn’t soaked into the ground and flows across the land it’s termed ‘surface water’. It can flow into other rivers and streams. When water evaporates from plants (through their leaves) it is called transpiration. The water is evaporated and enters the atmosphere.